The Kitty DeGree School of Nursing has a long history of excellence. The School was founded in 1960 and graduated the first class of baccalaureate nurses in 1964. Baccalaureate nursing graduates at ULM receive a broad based general educational foundation inclusive of history, english, science, and arts. Graduates also receive education in all aspects of nursing care and are prepared to work in a variety of health care environments. The baccalaureate degree program in nursing at University of Louisiana Monroe Kitty DeGree School of Nursing is accredited by the Commission on Collegiate Nursing Education (http://www.ccneaccreditation.org). The master's degree program in nursing at University of Louisiana Monroe is accredited by the Commission on Collegiate Nursing Education, 655 K Street, NW, Suite 750, Washington, DC 20001, 202-887-6791. 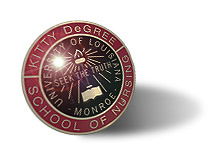 The University of Louisiana at Monroe Kitty DeGree School of Nursing (SON) shares the University’s commitment to a transformative education through instruction, research, and service. The primary mission of the SON is to offer a specialized program of study of the art and science of nursing which prepares its graduates to succeed and contribute through safe and effective practice as beginning professional nurses in a variety of health care settings. The SON mission is based on professionalism and the core values of altruism, autonomy, human dignity, integrity, and social justice. It is also the mission to provide continuing education to meet the ever changing needs of the nursing community, both locally and globally, and to promote the development of the nursing profession though scholarly activity.